Pick-your-own string beans are a sure sign that summer has arrived at Blooming Glen! Although we often don’t think about these beans as being particularly healthful, they actually have quite an antioxidant profile, which helps fight off the free radical damage that can cause illness, aging, cancers, and inflammation. They also have lots of fiber and offer a nice bit of plant-based protein. 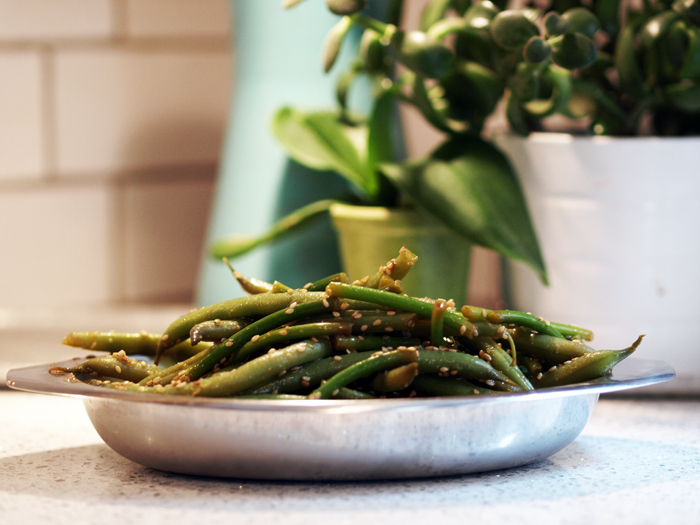 Given the heat as of late, Mikaela put together an easy-to-prepare, cool dish for the Blooming Glen Farm blog: Read more about string bean nutrition and get the recipe for Cold Marinated String Beans and Scapes by clicking here! >> Mikaela and Jason have been members of Blooming Glen Farm’s CSA program since its first season in 2006. Farmers Tom Murtha and Tricia Borneman and their dedicated crew grow over 75 different varieties of vegetables, fruits, flowers and herbs, which are available through the CSA, to restaurants and natural food stores, and at seasonal farmers’ markets. Click here to visit their website! This entry was posted on Wednesday, July 2nd, 2014 at 4:35 pm	and is filed under Food, Recipe. You can follow any responses to this entry through the RSS 2.0 feed. Both comments and pings are currently closed.